Is there anything more comforting and healthy than a nice warm bowl of soup? Probably not. Everyone knows that chicken soup is a very popular remedy for preventing colds as it has anti-inflammatory and antimicrobial abilities. But chicken soup is not the only soup that should come to mind when thinking about healthy and nutritious meals. I remember growing up in the South of France, my mother would make a version of Pot Roast. Only she would cook meat with a lot of thick bones, and cook the beef in a lot of broth. Then she would reuse that “bone broth” the next day or even the day after that. That broth would be rich and nutritious, because the meat, bones and all, would have cooked in it, along with delicious farm vegetables, and a few spices, including the fragrant clove. Bone as an ingredient for the most delicious soup is kind of gross. Yet, it’s sooooo trendy these days, with, I hear, New York hipsters replacing their Starbucks cup with a bone broth on their morning commute. I don’t know if that’s real or an urban legend. What I know is that bone broth is good. Good and good for you. A real protein power bomb, bone and bone marrow are known to be rich in protein and minerals and it gives the most amazing taste and depth to the soup. Another feature that bone broth has is that it contains a lot of collagen that is essential for healthy skin as well as bone density. Bone marrow has gained a lot of popularity recently as more and more chefs are using it to add depth to their meals, regardless if the meal is something fancy like a pot roast or something as simple as a warm and comforting soup. Also, it is great if you want your kids to increase their mineral and protein intake. Just sneak a nice beef shank or some other bones in the soup and remove them when they are done. They will never know just what gives that special taste they love so much. Combine the bones with some of the more popular soup ingredients like carrots and onions and you are ready to taste one of the best soups you have ever made. So, make sure to never chuck away those beef bones. It is like throwing away a nice piece of meat. It is always a great idea to use everything you can and not throw away good ingredients. Let me show you how you can make a very delicious and healthy soup with some of the most amazing ingredients. Your family or friends will think you are a real master chef, but they will never know just how simple this recipe is. Check out the recipe below, you can’t make a mistake with it. 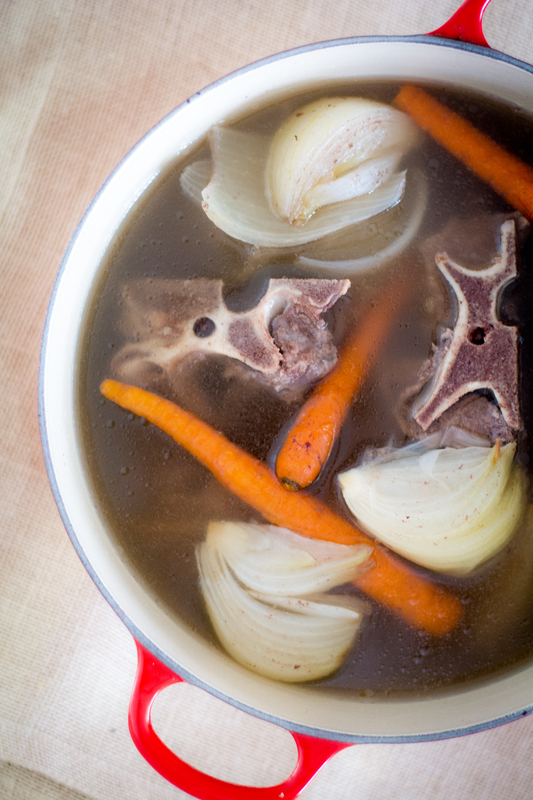 Making your own bone broth can be fun and simple! Plus, the benefits are too great to ignore! Put all ingredients in a 12-quart stockpot and add enough cold water to cover. Bring to a simmer, then reduce to a low simmer, for 5 hours. While simmering, occasionally skim fat and foam from the top using a ladle. Remove meat and bones with a slotted spoon or tongs; reserve meat for another use (such as soup). Pour broth through a fine-mesh strainer into a large heatproof bowl. Once broth has cooled, store in the refrigerator in an airtight container. Reheat as needed.